These days the QR code has become a common sight in news paper ads,especially those of cars.The quick Response code(QR) is two dimensional matrix barcode that can read by scanners and smartphones. The information encoded can be anything from text to URL or other data. 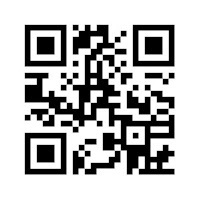 Here's how you can make your won QR code giving general information about yourself such as Facebook or Twitter user name. Generate your Qr code by visiting this like bit.ly/UbCu.Here you can choose from presets like URL,Text,Phone number and SMS and also choose the QR code size. Where do you think this one will take you?